– Ensure the correct Document version supplied during the production Process. – Customer has to ensure the correct production process following in Shop floor control. 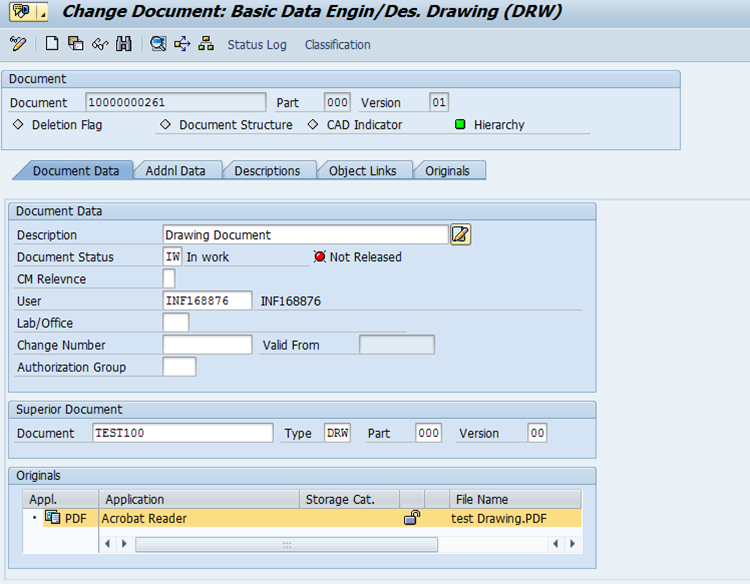 Document management can be used to manage drawings. All design drawings can be linked to material masters and Bill of Materials. A routing contains the sequence of operations for manufacturing a product. Documents can be allocated to the operations in a routing as production resources/tools. These documents may be used, for example, to describe the specifications of a product during the production process. Document Type : It categorize the Document according to the business functionality and organization aspects. Document version: Document version is used to manage the changes in the Document. Document Part: Document part is used to manage the several documents in One Document Number. 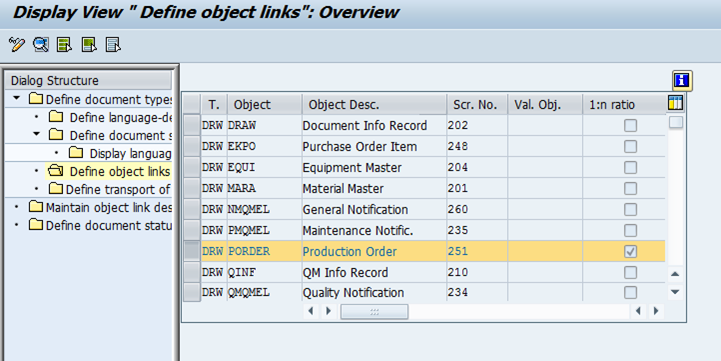 Object Links can be used to manage the Document integration with Material master, Bill of Material etc.. Enable the document type with production order in DMS settings for automatic explosion of Document. Enable the object PORDER WITH Screen number 251.This is used to transfer of Document from Material master or Bill of Material based on Production Scheduling Profile (Header material) Configuration. When creating the production order Documents from Bill of Material copied to Production order. 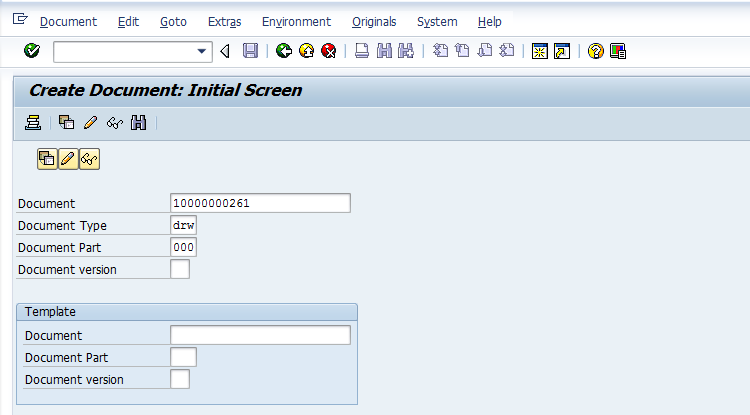 When Creating the Production order, Documents from Header material copied to Production order. 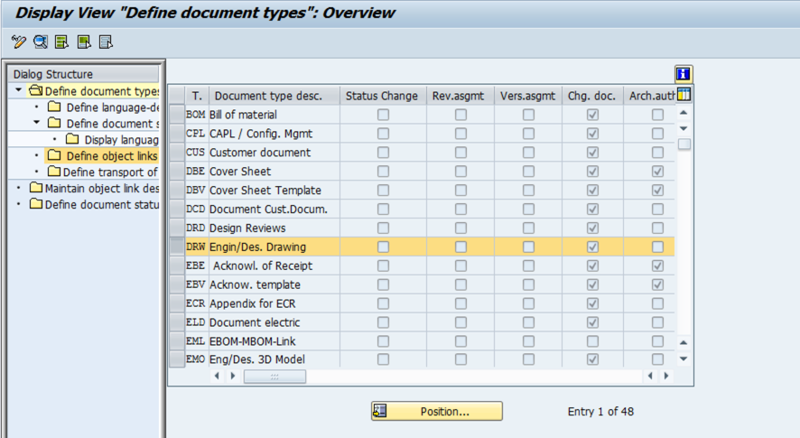 Documents from Header material and BOM will be copied to Production order. Document can be integrated via Document settings like Document type and production scheduling profile. Document type controls the type of drawings, status management and transfer mechanism like automatic or manual. Controls the type of Document to be used in SFC like from Material master or Bill of Material. 1. 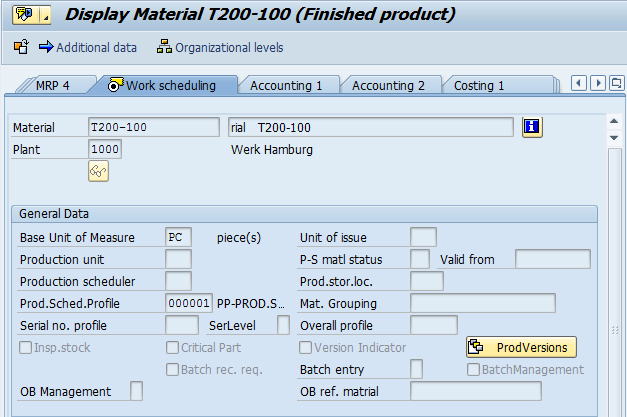 Automatic Generation of Document by Production Scheduling profile & DMS integration. 2. Manual Generation of Document in production order. 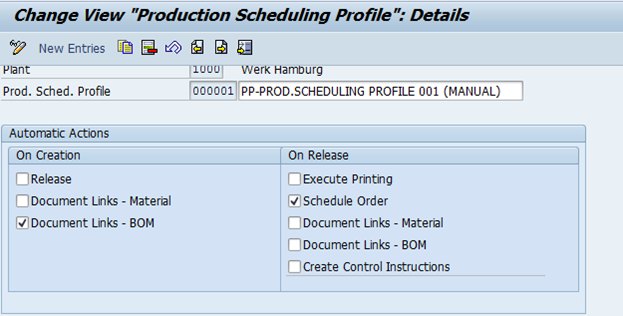 Document will be linked automatically during production order creation or release by production Scheduling profile. DMS integration -enable functionality of document to be used in shop floor Department. Shop floor people can identify clearly the production process to achieve the production effectively. GMT+8, 2019-4-23 14:58 , Processed in 1.068133 second(s), 30 queries .